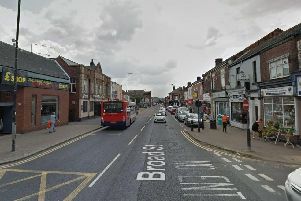 Inconsiderate motorists who park on zig-zag lines in Sheffield have been warned they face a £100 fine and three points on their licence. Two drivers caught in the act in Ecclesfield today were today issued with traffic offence reports, as police warned such behaviour would not be tolerated. They fell foul of the law by parking on lines on the High Street, within yards of a pedestrian crossing - despite numerous parking spaces being available nearby. Sheffield North East neighbourhood policing team said officers were listening to members of the public, who have demanded tougher action to prevent bad parking. The team posted photos of the two vehicles caught today, in an attempt to warn others of the consequences. "The drivers of these two vehicles picked up traffic offence reports this afternoon on High Street, Ecclesfield, for parking on zig-zag lines within yards of a pedestrian crossing when numerous parking spaces were available no more than a couple of metres away. To make it clear this a £100 fine and three-point offence," the team stated. "We appreciate people are busy. However, that is no excuse for putting safety at risk. They are there for a reason, adhere to them. No excuses." Traffic offence reports can be issued by police where they believe an offence has been committed but the motorist could benefit from attending a driver training course as an alternative to a fixed penalty notice or a court appearance.